Whisk lime juice, parsley, olive oil, water, garlic, chilli flakes, cumin, salt and parsley together to combine. Add the honey (or orange juice if substituting for whole30 option) and whisk again until the honey runs smooth through the rest of the ingredients. Divide. Set aside 1/2 of mixture to apply when tray comes out of oven. Arrange the salmon fillets, peppers and onion in a single layer on the prepared baking tray; and apply using basting brush. Coating evenly. Broil until the peppers are just beginning to char at the edges (about 10 minutes) and the salmon is cooked to your liking (about 10 minutes). 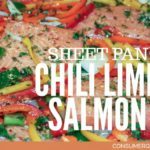 Remove from the oven and serve immediately with lime wedges and remaining marinade for added flavor. If you like your peppers a little more well done, plate your salmon and return peppers to oven until finished cooking.